Unexpectedly Whitebeard Pirates are out!! And of course, this will impact what will be used against the Legendary Hawkeye Mihawk. Let's take a look on Mihawk, The units that are effective and overall advice in general. Guaranteed drop in 40 Stamina. When 20% or less Health Mihawk deals 10,000 damage every turn using his Special when HP drops below 20% Health. Due to his low attack turn and decent damage - you have to be careful when facing Mihawk without a "Tank Team". The pre-emptive attack will essentially ensure that you have to control your stalling before facing the "great" Mihawk. Due to his Special Spam (when 20% health or below), it is highly advised to save specials in general for later in the battle opposed to earlier if you can manage (so that you can burst down the final 20%). The Nefartari Vivi Team is the definition of Tank Teams. You will have a secured/guaranteed win, however it will drastically increase the time required to clear. Expect to reserve an hour or more of your time to clear the Stage. The Laboon Variation of Vivi Teams will allow players to survive any 1 hit with 1 HP. The only catch is your health needs to be 50% or higher when they take the hit. As such, your Vivi (or friend Vivi) WILL need to heal 50% of your health or higher. Due to this - you will generally use weaker units (for the lower HP) so the battle will take longer than the other Vivi Team variations. The Tank Zoro variation works in the opposite of Laboon. While the player has 100% health, reduce the damage taken by 80%. As such - Vivi needs to heal back the damage dealt by Mihawk. In 30 Stamina, the most damage that Mihawk can do is 10,000. When reduced due to Tank Zoro's ability - the damage drops to 2,000 damage. Thus Vivi will need to be level 72+, so that you can heal back 2,000 health to continue tanking. Take a break, you can continue the battle later if you get bored xD! Most people that invested into pulling the mighty Gear 3 Luffy will have possibly the easiest time with this Raid Boss. Gear 3 Teams have a crazy amount of damage output. They WILL need to run Hammer Usopp (in most cases) to secure the win - but realistically, as long as PERFECTs are hit, Mihawk is easy. Gear 3 Teams do NOT tank - they are squishy. As such using Usopp will be extremely useful to assist players to secure the win (buy enough turns to win). Due to the minimal amount of Stages (5 Stages only), it isn't advised to use the 20-turn Sogeking. Stall in the earlier Stages to have Golden Pound Hammer Usopp ready but be careful not to take too much damage. Make sure you come into Mihawk with a decent amount of health or risk dying to Mihawk's pre-emptive strike. The premier team for Mihawk. Whitebeard Teams are known to clear every Raid Boss and will have a fun time against Mihawk. It is advised (similarly to Gear 3 Teams) to run Golden Pound Hammer Usopp to negate the 30% or below risk. Users of this team is recommended to plan their health so the pre-emptive strike will put them at 30% or below which initiates the skill. Due to most of Whitebeard's Skill not being MAX :P and/or most Whitebeards not being a 6-Star Unit... Golden Pound Usopp is suggested just to ensure the ride is a little less bumpy and bring a more guaranteed Victory. Stall in the earlier stages (don't be afraid to take hits) so that Mihawk's pre-emptive will take you down to 30% or below health. You should have Usopp's Special ready for Mihawk and get your boost. A more risky team compared to the ones above. 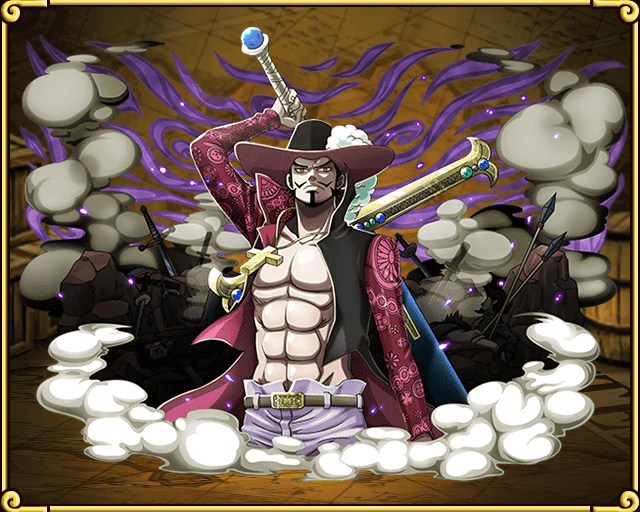 STR Teams may be able to clear Mihawk 30 with a bit of help from Golden Pound Usopp. High level STR units are recommended for this team as well as damage reduction like Alvida for those "just in case" moments. If you can't do 20% of Mihawk's health in 1 turn - it is not advised to run this team. Just in case, the battle gets tough... Alvida may be able to help. Her damage reduction buys you an extra turn while not destroying your team's damage output completely. As such it is advised to use her if you can. I hope your STR Units are ready - it will be a tough battle filled with bumps and bruises. 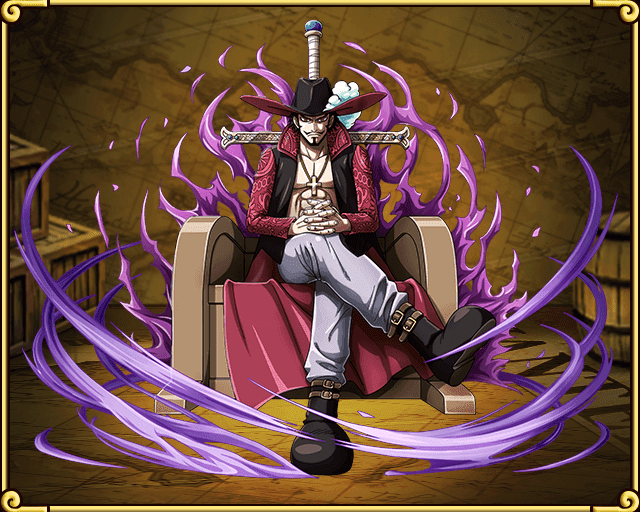 But if you have a good collection of STR Units which are high levelled - Mihawk will fall before your might... I guess Arlong becomes the World's Greatest Swordsman? When 20% or less Health Mihawk deals 25,000 damage every turn using his Special when HP drops below 20% Health. The Strategy changes here for 40-Stamina - it is advised to use STR Burst Characters such as Gear 3 Luffy, Mr. 5 and Laboon for the final 20% of health (as you cannot tank it) Damage reduction characters like Alvida is also highly recommended. Stall effectively to try and get your Hammer Usopp special up before Mihawk. This means that hitting a unit with only 1 unit as opposed to all 6 at times.